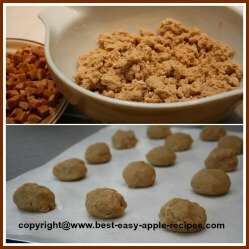 These Simple Caramel Apple Cider Cookies make a great Fall/Thanksgiving Cookie Recipe, or make them for a fun snack cookie! If you like caramel apples, you will love these! My daughter, Karissa, made these cookies to take along to her friend's family Thanksgiving Day get-together, and they were gone in "no-time"! Peel the wrapper off the caramels, and cut each of the caramels into four pieces (see picture). In a large bowl, using an electric hand mixer, cream together the butter, sugar, salt and the apple cider instant drink mix, until well combined and creamy. Beat in the eggs and the vanilla extract. In another bowl combine the flour, baking powder, and baking soda. 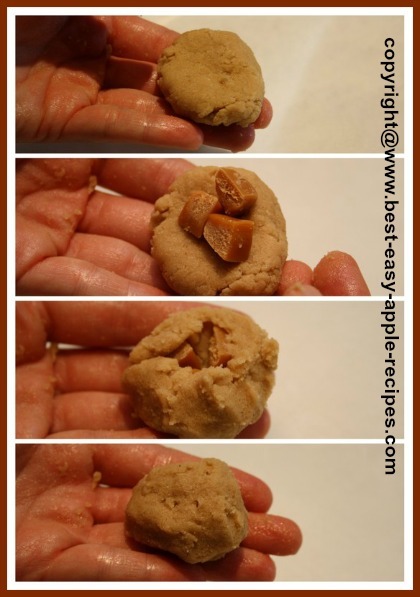 Take about a 1 - 1/2 inch ball of cookie dough, and use your fingers to flatten it into a disc shape (see pictures). Place four pieces of the cut up caramel into the center of the disc, and work the cookie dough around the caramel, sealing well (see pictures). Place the prepared cookies on a parchment-lined cookie baking tray, about 2 inches apart to allow for expansion of the cookies. Bake at 350° F for about 12 - 14 minutes, or until cookies are golden brown around the edges. Do not over-bake. After removing the cookies from the oven, carefully slide the parchment paper with the cookies onto the counter. Allow the cookies to cool until they are no longer soft, but still slightly warm, and then remove them from the paper (they may need a little "twist" to remove them). If cookies seem to stick, place them in the freezer for a few minutes on the baking tray, and they will come off the paper easily). 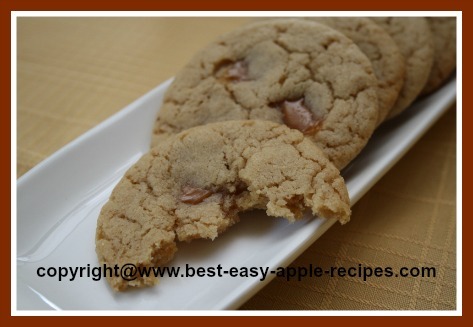 Allow apple cider caramel cookies to cool completely on a wire rack.